Tasha Smith is so much more than a hairstylist and makeup artist in Kansas City, MO, she is also a health and wellness mentor. This means that Tasha cares about every aspect of the client that she is working with and this is reflected in the final results. She has been providing her services to brides in the city for two decades and over this time has become known for using the latest techniques to achieve almost permanent makeup results, which means your look will last whilst you dance through the night. Roots & Branches is a salon in the heart of the city where you will find some of the most talented artists for bridal makeup. Each professional at this salon has years of experience in their craft and thus have the skills needed to apply or achieve any look you desire. They are all friendly and incredibly fun to work with, which means you can sit back and relax while they take away the stress of getting ready and of the entire occasion. When Cristy founded On The Set Styling she aimed to provide the highest quality of makeup styling to clients throughout Missouri. Over the past 16 years this artist and her team have achieved this goal with a range of clients. She now provides one of the leading services for wedding hair and makeup and viewing her portfolio will show you a number of brides that she has worked with in the past. Reviews of the work of On The Set Styling always mention that this team is incredibly easy to work with. For the bride that wants something more than what the average Kansas City makeup artists can provide she should certainly go to Paige Pelfrey for her wedding look. While her resume of previous experience is certainly impressive it will be her portfolio that will convince you to hire this expert. Every bride that she works with will get a unique experience and this professional knows exactly how to bring out all of your natural beauty while developing the look you’ve always wanted. 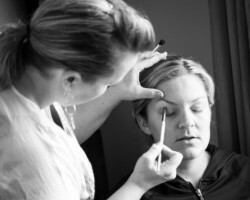 Hiring Makeup By Elva is one of the best ways to make sure you look great on the most important day of your life. This company offers complete on-site bridal packages that can be customized to your specific style. This ensures you feel confident and comfortable with the final look. What makes working with this company even better is the fact that their expertise comes at affordable prices. They will get you ready for your wedding in the most enjoyable way.